Core Principles of Group Psychotherapy is designed as the primary curriculum for the Principles of Group Psychotherapy course in partial fulfilment of the Certified Group Psychotherapist credential awarded by the International Board for Certification of Group Psychotherapists. The text is divided into five modules: foundations, structure and dynamics, formation and development, leadership tasks and skills, and ethics, neuroscience, and personal style. The book is part of the AGPA Group Therapy Training and Practice series. This series aims to produce the highest quality publications to aid the practitioner and student in updating and improving their knowledge, professional competence, and skills with current and new developments in methods, practice, theory, and research, in the group psychotherapy field. 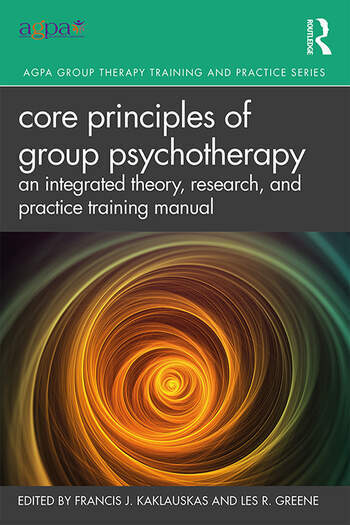 In addition to helping group psychotherapists bolster their skills so as to ensure the availability of quality mental health services, this guide is an essential resource for students and clinicians interested in learning more about group psychotherapy, as a text in academic courses, or as part of a practicum or internship training curriculum. Francis J. Kaklauskas, PsyD, CGP, FAGPA, has worked for over 25 years as a group clinician in a variety of clinical and academic settings. He teaches and supervises group psychotherapy at the University of Colorado and Naropa University. He has co-edited several other books and has published widely on the pragmatic integration of theory and research into clinical practice. Les R. Greene, PhD, CGP, LFAGPA, is a past president of the American Group Psychotherapy Association and a Distinguished Fellow of AGPA. He has served as editor of the International Journal of Group Psychotherapy. He is on the clinical faculty of Yale University School of Medicine and the staff of the VA CT Healthcare system where he teaches and supervises group, couples and individual psychotherapy.